Asking your mom or your friends for advice is cool, but have you ever just asked the internet instead? Most likely, the answer is yes. In this modern age, it’s pretty standard to take to an online search engine before you do something you’re not sure about. From your phone or your computer, Google is always there to overwhelm you with millions of search results when all you want to know is whether you can believe the urban myth that you can’t take a shower during a thunderstorm. Every state has its most-asked questions, and the internet always has an answer. Whether that answer is right or not, well, that’s a matter for another day. 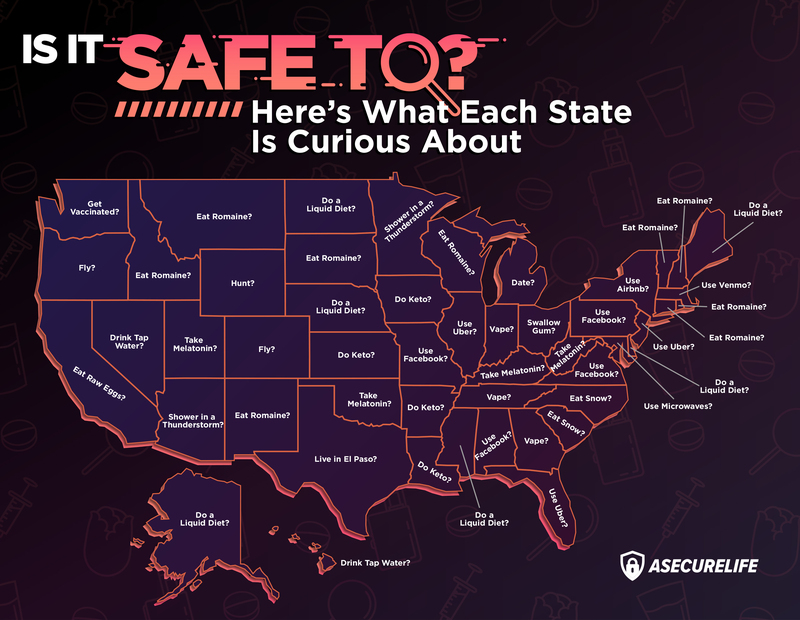 Here are some of the most-googled concerns by state, from the serious to the silly. Some of the questions asked by certain states are pretty entertaining. Arizonans and Minnesotans are curious about whether it’s safe to shower in a thunderstorm. The good citizens of North Carolina are wondering whether or not it’s cool to eat snow. And the people of Michigan must be swiping right: they want to know whether it’s safe to date. Here are some more notable results. Is it safe to do a liquid diet? Six states want to know whether the juice cleanse is worth it: Alaska, Delaware, Maine, Mississippi, Nebraska, and North Dakota are all asking if it’s safe to do a liquid diet. Is it safe to use Facebook? Do Keto? Take melatonin? After last year’s major data breach, Alabama, Missouri, Pennsylvania, and Virginia are taking to Google to find out whether they can trust Facebook. Meanwhile, Arkansas, Iowa, Kansas, and Louisiana are looking to get into a healthier lifestyle and want to know if the low-carb, high-fat Keto diet is safe. And the people of Kentucky, Oklahoma, Utah, and West Virginia are just exhausted, frankly: those states are googling whether it’s safe to take melatonin. It’s interesting that a lot of states have the same concern—whether it’s safe to take melatonin, eat snow or lettuce, or vape—while some states have area-specific concerns. Texans are concerned about the safety of El Paso. New Yorkers are worried about the safety of using Airbnb. For the most part, though, it looks like we all worry about a lot of the same things. Good thing we can always ask Google.